Feel Beautiful inside and out this Valentine’s ! It is said that beauty lies in the eye of the beholder. Thus, we’re sure that your beloved looks lovely all year round. However, you can now give her a gift that will enhance her beauty even more this Valentine’s Day. What’s more, these are the must have shades of the season and have been specially packaged together to make a hamper that will make your lady love squeal with delight! They are also a steal at these prices! So what are you waiting for? A special surprise in the form of amazing free gifts awaits while you shop for your loved ones. 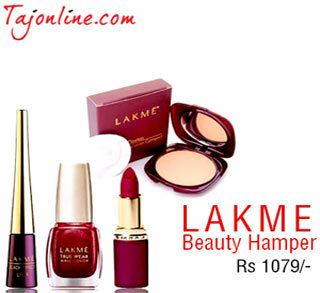 Tajonline.com brings you an exclusive range of makeup from Lakme that will have your beloved shrieking with delight! So HURRY and get her a gift she will love!